Discussion in 'Transformers Fan Art' started by Ra88, Sep 1, 2010. Here's an idea I had earlier today when mucking around with my Primus, and did a quick photoshop of to see what it would look like. I have a pretty good idea of how to do it, but I'm not sure if I want to hack up my Primus, or what to use for Omega's hand (don't have the G1 figure or another CD Red Alert). But the one major problem is how to attach Metroplex' chest parts. The current idea I have is to somehow fit them over Primus' upper arms, but that leaves a gap. I could also try to bring them closer to the body, but that would require extensive cutting, and would get rid of the wide look that he had in the game. It's probably simpler to just find filler of some kind, but I have no idea what I could use. Oh, and a note on the legs; the idea I had is to take apart Primus' legs and fit the hollow part over Metroplex' upper legs. Either that, or remove Metroplex' upper legs all together, try to cut off everything past Primus' kneejoints and directly attach them to Metroplex' lower legs. I have no idea though if that'll work properly, and I'd lose articulation (and the ability to lengthen the legs). It's just a bit hard to properly convey in pictures, since Primus' kneecaps get in the way. I also tried thinking of something that could set the legs further away from the crotch and have them be hinged like in the game, but I have no idea of what I could use for that. I considered a few options, but none of them would work, thanks to the weight of the upper body. But yea, something I may or may not do, but wanted to share anyways. If anyone wants to try and do this, go ahead! I'd like to see if it really is possible. can that even transform? who cares, it's epic! Maybe. The head should still be able to retract, as well as the arms moving down, so if I find something that can store on his back and flip up to simulate the cannon he had...I'll have to think about this. Maybe a face covering would make this a little more Omega Supreme like. 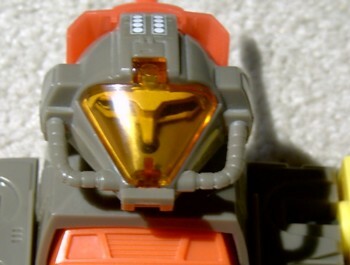 WFC Omega Supreme didn't have a face visor. Nice Idea Ra88. His legs are shorter but other than that good concept.